Dig out that gypsy skirt and peasant top from the back of your wardrobe and get ready for Karavan! 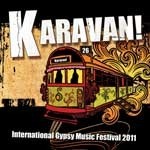 International Gypsy Music Festival at the Corner Hotel in Richmond on Saturday 26 February. Gypsy music has been a growing underground trend, quietly bubbling away over the last few years. Many new groups have recently emerged and drawn inspiration from this bohemian music genre, merging it with their own signature styles. Headlining the event is GIPSY.CZ from Prague who will be presenting their addictive toe-tapping tunes under new genre, 'Gyphop' – a fusion of gypsy, hip hop and pop music. The group consists of singer, rapper and composer Radoslav 'Gipsy' Banga, violinist and singer Vojta Lavicka and the Surmaj brothers, Petr and Jan. Radoslav Banga or 'Gipsy's' story is an inspiring one as he managed to rise above his challenging past as a street kid. Gispy has conquered adversity through his love of rap and hip-hop and became the Ambassador of Minorities in CZ in 2007. GIPSY.CZ have toured Germany, Austria, Great Britain, the Netherlands, Hungary and Slovakia and have been acknowledged for their contribution to music with a nomination from The Academy of Popular Music at the Angel Awards 2005 (the Czech version of The Grammy Awards) for Best Album in the Hip-Hop & R´n´B category. In 2006, GIPSY.CZ went on to win the Best New Artist award. HAREM'de' hail from Turkey and are debuting in Australia at Karavan! with their unique gypsy percussion performance. Lead by master percussionist, Yasar Akpence, HAREM'de consists of clarinet, keyboards, two percussionists, kanun (a beautiful string instrument played on the lap by plucking its strings) and drums. 'HAREM'de's repertoire is varied, ranging from traditional songs to up-beat, energetic pieces that compel you to dance. There are also some outstanding Australian acts such as DJ Sista BB, Babaganoush, Arte Kanela and Lolo Lovina. Lolo Lovina are a Sydney based group lead by singer Sarah Bedák and comprised of other members from the Ukraine and Hungary as well as Australia. Jara Johnson-Anderson is on double bass with Leonid Beshei on Romanian accordion and saxophone, David Carr on guitar and Matthew Baistow on tenor banjo. Arte Kanela's forte is Flamenco and the last twenty years have seen them collaborate with artists such as The Cat Empire and Kate Ceberano, whilst featuring on television programs including Dancing with the Stars and Getaway. With festivals such as WOMADELAIDE and WOMAD New Zealand, Woodford Folk Festival, Melbourne International Arts Festival, Sydney Festival, Bellingen Festival and Port Fairy Festival under their belt, the talent and captivating performances of the Tedesco brothers is unique and unrivalled. Babaganoush offer an original fusion of Balkan folk music, Russian dances and traditional Greek music as well as music from Eastern Europe. The energy and passion in their performances is extraordinarily captivating and will leave you longing for more.